Outlined in the exemplary program for Liz Wendelbo's film Opticks is her definition of "Cold Cinema": filmmaking that "predicates resistance to cinema as a virtual medium." Wendelbo's latest 16mm piece, which premiered yesterday, expresses alienation, anxiety, and metaphysical dread yet somehow veers away from frigidity borne of an emotional void. On the contrary, the chilling space Wendelbo purposefully injects into her "reel time" film provides just enough "philosophical space" to allow the viewer to project his/her own interpretations onto the experience. The film was initially inspired by Wendelbo's fascination with Isaac Newton's principles of color, which he wrote about in his 1704 study also entitled Opticks. 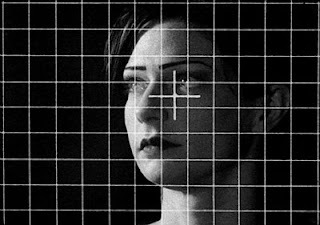 She gives us 14 short films that incorporate a re-occuring optical grid, linear movement, and absolute body control as exemplified by a ballet dancer and a military officer. Interspersed are experiments involving stock footage of WWII tragedies and triumphs, all of which feature a masterful synth-driven soundtrack provided by Wendelbo's Xeno and Oaklander bandmate and Martial Canterel founder Sean McBride. The ominous sound, at times dissonant, minimal, and foreboding, has been "purposefully disconnected from the original footage," she explains in the notes, "so as to depart from the 'Mickey Mouse Effect', whereby sound follows image." What occurs, then, is 50 minutes of optical illusions, allusions, concealment and revealment. Favorite sections include the melancholic ballerina en pointe in black ballet slippers and a German Expressionist visage, and the piece entitled "Columns." The latter takes a voyeuristic look at the shapely obelisks used to construct ornate furniture. The masked workman and the caress of the camera moving slowly up the carved pieces of wood hold a chilling and strangely stark eroticism. Catch the next showing at the White Columns gallery this Tuesday evening at 6pm. Wish I could've seen it, sounds right up my alley.